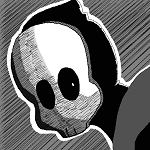 A story about a mysterious skull masked man that shows up out of the blue and makes a name for himself.A girl named Chelsea eventually becomes his friend as she tries to learn more about his mysterious ways.. I don't know how I can express my gratitude towards you for making such an amazing story and continuing through with it, never abandoning it while you posted pages regularly. I've been reading it for years and I'm not the kind of person to ever read webcomics or fanfiction, but this is really something else. I love the story and I appreciate the dedication and the amount of effort you always put into this. It's such a brilliant work of art, so I thank you for creating something as wonderful as this. It's so unique and unlike anything I've ever read before. Needless to say, this is perfect. Unless this is the end of a chapter and I'm having a heart attack for no reason. Is this the end of the comic or chapter?